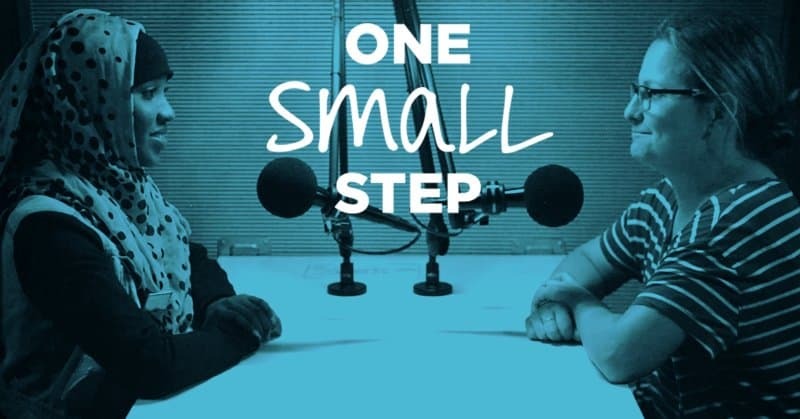 Hartford, Connecticut, July 12, 2018 – This fall, national story archivists from StoryCorps will bring their latest initiative, One Small Step, to the Trinity College campus. From October 11 through October 13, 2018, StoryCorps will record one-on-one discussions so that participants—and others who hear these conversations—may bridge partisan divides and better understand each other. Interviews will follow the usual StoryCorps format—two people, 40 minutes, and a facilitator to help guide the conversation. But while other StoryCorps conversations typically feature two people who know each other well, most One Small Step discussions will be between individuals who have not met before. The three-day StoryCorps visit to Trinity will coincide with the college’s annual Homecoming Weekend, increasing opportunities for Trinity alumni and families to participate in One Small Step along with students, faculty and staff members, and other Greater Hartford community members. Those interested in participating in One Small Step at Trinity were asked to share their interest by August 15. Between late August and September, StoryCorps will be reaching out to potential participants to gather more information and to determine the final list of participants, according to Trinity faculty members Lucy Ferriss and Irene Papoulis, the college’s liaisons with StoryCorps for the One Small Step initiative. Questions may be emailed to onesmallstep@trincoll.edu. One Small Step comes to Trinity on the heels of the college’s yearlong initiative, Bridging Divides: Higher Education’s Role in Advancing Understanding and Promoting a Just Society. Bridging Divides programs, which took place at Trinity throughout the 2017–18 academic year, involved discussions of race and racism, academic freedom and freedom of speech, power and privilege, and the challenges inherent in holding productive dialogue on such topics. With the permission of participants, One Small Step conversations recorded at Trinity will be added to the national StoryCorps Archive, which is housed at the American Folklife Center at the Library of Congress. Edited versions may be broadcast on a partner public radio station or possibly selected for national broadcast on NPR. Trinity will receive a digital archive of the One Small Step discussions recorded on campus so that they may be shared with the local community and incorporated into teaching and learning opportunities at Trinity. The One Small Step project is supported by a $1 million grant from the Rockefeller Foundation. Since its founding in 2003, StoryCorps has collected and archived nearly 75,000 facilitated interviews from more than 150,000 participants from across the country who visit one of the nonprofit organization’s recording sites. Segments of StoryCorps interviews may be posted on the StoryCorps website and may air nationally on NPR’s Morning Edition. An independently funded 501(c)(3) organization, StoryCorps is the recipient of numerous honors, including Peabody and MacArthur Awards.